Well, well, our Slow & Steady portfolio has taken a little knock back – our first in nearly a year , and our second in nearly three . It’s worth going back to those earlier posts in the series. They help put things in perspective. This is normal sailing weather. The market decline of the last three months has knocked just north of 3% from our portfolio. Hardly the stuff of broken dreams, especially if you haven’t been living it every day. To be honest I haven’t looked at the portfolio’s returns since last quarter’s check-in , so I’m pleasantly surprised. The snatches I’ve overheard on the news prompted visions of worse. Some friends who know that I invest talk to me like knowing how many points the FTSE fell in the last 24-hours is useful information. I think it’s as relevant as yesterday’s weather in Helsinki. The market has a 50-50 chance of being down on any single day, so I’d rather skip that dose of disappointment and stick to more convivial time frames. Hell, there’s a one-in-three chance the market will kick sand in your face in any given year! The Slow and Steady portfolio is Monevator’s model passive investing  portfolio. It was set up at the start of 2011 with £3,000 and an extra £935 is invested every quarter into a diversified set of index funds, tilted towards equities. You can read the origin story  and catch up on all the previous passive portfolio posts . Our annualised return is still a very healthy 9.48% over seven years now. Sure it was 10.92% last time I reported and I liked that better. But if you’d offered me 9.48% seven years ago, I’d have bitten your hand off – and then reported for psychiatric treatment. As it is, the prices we’re paying now look remarkably like the prices we paid at the end of September. We’ve only taken a few steps back. A few other things catch the eye, apart from the Brexit Britain slow-bleed of UK equities. Conventional UK bonds (not the inflation-linked ones) were a bright spot – okay, not a bald spot – and so we caught a few crumbs from diversification’s free lunch. That is until global property forced us to choke them up again. Property was a top performer in the portfolio a couple of years ago but it’s been our only losing asset over the last 12-months – down 8.03%. Over five years property is still up 5.84% annualised. I read a few years ago that property was a heavily overvalued asset class that wouldn’t fair well in a rising interest rate environment. So be it, I’m happy to take the pain in 7% of the portfolio, knowing that fortune will swing back, eventually. Hey, and we know diversification is working when something is causing us pain, right? One thing that stands out as I look back through seven years of Slow & Steady portfolio reports is that it’s become the investment diary I would never have written on my own account. Tracking the perihelion journeys of the asset classes is instructive. They wax, they wane. Emerging markets glow hot, then fizzle out, then catch light again. The US bubbles and boils. How long before we’re burned? Everything we’re seeing is predicted by the physics of portfolios, although the Slow & Steady has yet to fully fall to Earth. Every quarter we shove another £935 into the cavernous cake hole of the capital markets. 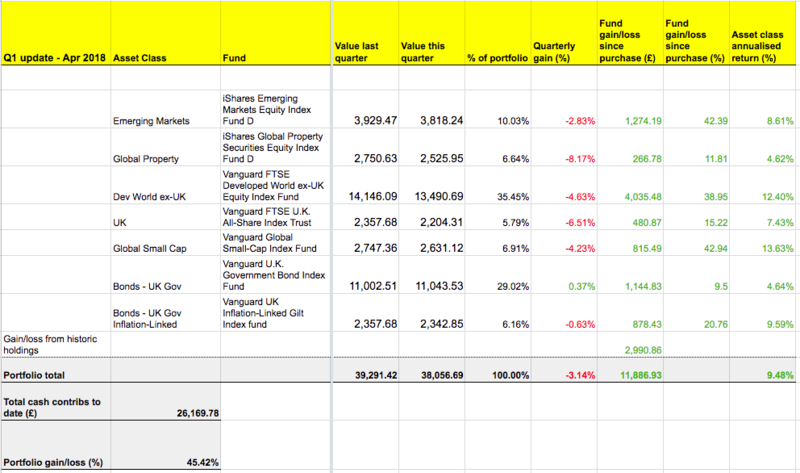 Our cash is divided between our seven funds according to our pre-determined asset allocation. Platform fee = 0.25% per annum. This model portfolio is notionally held with Charles Stanley Direct . You can use that company’s monthly investment option to invest from £50 per fund. Just cancel the option after you’ve traded if you don’t want to make the same investment next month. Take a look at our online broker table  or tool  for other good platform options. Look at flat fee brokers if your ISA portfolio is worth substantially more than £25,000. The Slow & Steady portfolio is now worth over £38,000 but the fee saving isn’t juicy enough  for us to push the button on the move yet. If all this seems too much like hard work then you can buy a diversified portfolio using an all-in-one fund such as Vanguard’s LifeStrategy series .